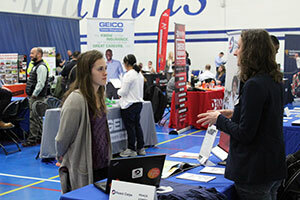 Virginia Wesleyan’s Career Development and Internship Program will host its annual Career Fair on Thursday, February 28 from 10:00 a.m. to 1:00 p.m. in the CMAC in the Jane P. Batten Student Center. Company Information Table. We will set up a table for your company in the Jane P. Batten Student Center where you may speak informally with students. $50 fee covers table, flyer printing and posting, social media posts, and notification to appropriate students and departments. Company Presentation. We will reserve a room for you to give a presentation. $50 fee covers table, flyer printing and posting, social media posts, and notification to appropriate students and departments. Campus Interviews: Employers may conduct interviews on campus either by pre-selection or open appointment. To arrange a campus recruitment event, call 757.455.3401 or email the CDIP Director at rdunmyer@vwu.edu. Marlin Careers, powered by Purple Briefcase, is the best place to post part-time, full-time, and internship opportunities. Create an account by clicking: Marlin Careers. Fill in the information, and click Continue. Navigate to the My Schools page. Scroll down to the Request Access section, and select VA. After the schools load, scroll down to Virginia Wesleyan University, and click Request Connection. We will approve your profile within 1-2 business days, and you will be able to connect with students and post job and internship opportunities. Build your company’s profile including a 200x200px image of your company’s logo! Complete your company’s profile. This attracts more interest than an incomplete profile. Profiles are managed on the My Profile page of your Marlin Careers account. Enter your job or internship opportunity. Then hit Submit. Click Save at the bottom of the page after you finish.